Ryunan is a 5-star unit that plays the Physical Damage role. His stats are well rounded for his rank and he has a variety of different damaging skills. Ryunan is a Dragoon so the majority of his skills have a jump delay. His ability to output damage is actually very good for a 5-star and most of his skills come with a secondary effect. Most of the secondary effects range from increasing or decreasing stats and healing. And they’re all generally useful to have stacked onto a damage dealer like this. 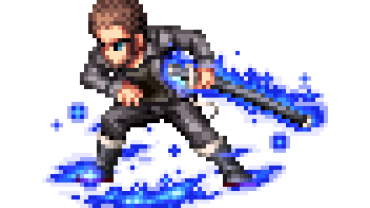 Outside of the jump attacks, Ryunan has Lance which is a great attack that deals damage and has a drain for both HP and MP. So being able to dish out this damage and get a little restore in return is great. Like most Dragoons he has increased damaged on dragons from his trait Dragon Killer. He also has Dragoon Spirit which increases the damage of all jump attacks by 120% making them vastly more effective than they would be otherwise. Verdict: A very good 5-star damage unit. An especially useful Dragoon. Ryunan is neutral to all elements and status ailments. Ryunan can equip 3 weapons and 4 armors. A young dragoon. Ryunan seems to be from the Dragon’s Village of Paladia, and his resemblance to the Dragoon named Duke is uncanny, but his past is enveloped in mystery. Although his appearance is quite young, he wields his lance with great power and expertise. Rumor has it he is in search of something he has lost.